Being a photographer who captures weddings as part of my specialty, I have worked with many brides over the years. There are certain things I do to get myself prepared for every wedding, like check my equipment, charge camera batteries, and get plenty of rest the night before the big day; but, what about the bride? What does she do to prepare herself for the most important photos of her life? Below is a list of things I think would help a bride prepare for her wedding day photos. 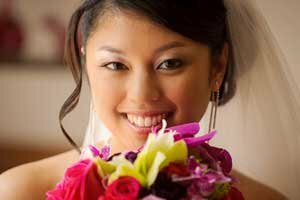 If you follow these simple steps, it would benefit your wedding photographs. While it's quite common to stay up late the night before your wedding in order to organize any last minute changes, or just to party it up, it is recommended that you don't skip a full night of rest before your wedding. You can always party it up two days before. If you don't - you risk being tired, which will translate to less than flattering wedding photographs. Try to plan ahead when it comes to your wedding day, get to bed on time and sleep plenty. You'll be very happy that you did - not just on your wedding day - but once you see your wedding photographs as well. I know, this may sound like something you hear from mom, but its true. I have seen so many brides going without food and drinks as the day is so full of so many things, that the last thing you want is your wedding video end up on America's Funniest as you fainted at during the ceremony. Also, being dehydrated or hungry may make you cranky and cause delays in the tight photography schedule that we worked so hard on. Eat small amounts of food rich in proteins, which help to keep you feel fuller longer. Drink plenty of water, and try to avoid alcohol until reception, especially in the summer months. Most weddings will want to have formal photographs taken at nice locations such as parks, beaches or inside buildings rich with architectural highlights. It is important to have these locations researched prior to your wedding day for many reasons. On your itinerary provide a map and exact address of these locations to your vendors, family and friends who need to know where to go the day of. Ensure you look after any permits you may need to obtain for any location. Some cost money, others just need you to ask for permission. Failing to do that can result in hefty fines which will not go over too well on your wedding day. Once you are on location, listen to your photographer. He is the professional, he knows which locations work well, and as much as that water fountain looks good to you, it may not be ideal to photograph for a variety of reasons. As a photographer I would still take those photos if the bride insists, but she will not like them afterwards, and valuable shooting time is then wasted on a 'dead' location. Provide your photographer with a shot list for the formal photos. This will save so much time and make the creative session go smoothly. Ensure you give enough time for portraits of the bride and groom alone as well. The way it works the best in my experience is the have the big group shot done first, and then work on smaller groups, so that grandparents, or others - can start making their way to the reception hall for cocktail hour. Your list should contain the names of the people you want in each shot, and their relationship to you. Assign someone to help with this session, such as a bride's maid or family member, who is familiar with the people on the list. Some brides want to have a full day multiple page shot list given to their photographer, which includes the must have shots they want. Though this may sound like a good idea, it is quite counter-productive. You risk your photographer staring at the list and missing great moments in the meantime. I always strive to be looked at as a trusted advisor by my brides, and thus they know I document all the relevant details that should be documented. My common rule of thumb is if the bride spent any time planning or money on something, it's worth documenting. As professionals, we all pride ourselves on our ability to work fast, and solve difficult situations on the fly. Giving your photographer a half hour to do your formals is not uncommon. These photos will be a family heirloom and will be looked at by generations to come. All brides tell you that photos are the most important part of their wedding, so why would they only allow 30 minutes for this session? Being rushed will not get the results you want, will make you stressed out. It takes time to set up lights, test shots, ensure uncle Henry's glasses are not throwing a nasty glare back into the lens and so on. Please, please allow your photographer 1-2 hours for these sessions - you'll be glad you did. Here is another tip: see if you can have this session take place prior to the ceremony. Yes, it may be a bit unconventional, and us photographers refer to this as a 'first look' session. I have found that it makes the schedule so easy thereafter, while maintaining the integrity of the romance of the first look. Just imagine having the formals done, going to the ceremony, then straight to cocktail hour! The reason people are a bit resistant during the formal sessions is because they know that their friends and family are already at the reception in a nice air conditioned hall, drinking and having fun and that's where they'd rather be. One of the most important tools in my bag is, well, myself. If I am not where I am supported to be, there will be no photos! So please give all your vendors that need to be in certain places at certain times, a complete detailed itinerary. Give 15-20 minutes room for mishaps, or unforeseen things like traffic problem. Be as detailed as possible, and include all relevant times, locations with full addresses, provide the contact information for the bride, the groom, the maid of honour, the wedding planner and venue contacts. Ok, so there - I said it.. this is a life saver, or, at least a photo saver. They come in a small pack and are used to soak up any excess oil from your skin and come in handy on those hot summer days. It's a good idea to carry a few packs of these while you are having your photographs taken, which will reduce the shine on your forehead, nose and cheeks. If you are of darker complexion it is even more important as darker skin tones reflect back far more obviously than lighter skin tones.